How to find, store, season and mill trees and how to turn them into beautiful shelves, doors, worktops, etc. Payment and booking form are required to complete a booking. Bookings are date specific. It is not possible to transfer from the April Course to the October Course. Normal cancellation policy applies. Click here for our cancellation policy. Suitable for woodworking novices and those with experience, students will get a tour of the Mud and Wood House showcasing the possibilities for using timber in its most natural form. Learn how to find suitable trees, how to get them from A to B, and what to do with them then. Visit the woods to find out which species are suited to which type of work? Find out about the machinery available for hire in saw mills and commercial workshops and how it can save you time and heartache. Get hands-on experience making natural edge timber shelves and a stool ... or if you are feeling more ambitious, why not tackle a bench or table? Please note that free timber will be available to make shelves and stools. However, a range of better quality timber will be available for use, if desired, ranging from €10 to €30. For larger pieces of furniture, prices will vary depending on quality and scale. 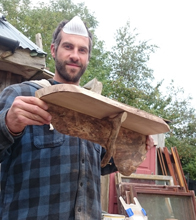 The course will be taught by Colin Ritchie, carpenter, furniture-maker and natural builder, in the grounds of the Mud and Wood House. Classroom-based lectures will take place in the house. Bring good waterproof clothes and footwear for outdoor demonstrations, practical classes and tour. Bring a notebook and pen for theory. A hardback notebook or a clipboard is advisable if you want to take notes during outdoor workshops. Handouts will be provided for certain topics . Bring a hammer, cordless screwdriver, sander, saw, spirit level, measuring tape and pencil if you have them. We have extra on site, but if you have your own, you will not have to wait around for them. Free timber will be available to make basic shelves and stools. Better quality timber will be available for purchase. Prices will very depending on the quality and scale of the piece. "Excellent course. Excellent value for money. Colin teaches in a very down to earth manner and answered every question he was asked. He divided his time equally between everyone when working on our projects. I'm going home with a fab coffee table - happy days! I will hopefully be back for a longer course later this year." "Thank you so much for a wonderful weekend. Colin was a really encouraging teacher with so much useful information to pass on. My confidence and knowlege in woodwork has definitely increased from taking this course." 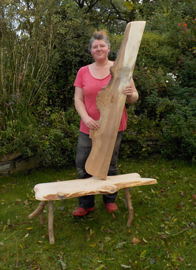 "As someone who is a complete beginner with woodworking, I was delighted with this course. I feel confident enough to try more projects and I love the pieces I made on the course. Colin is a fantastic wood artist, and a generous and patient teacher. Highly recommended course." "Thank you Colin and Féile for inviting me into your beatuful home and sharing your vast knowledge. I've thoroughly enjoyed the Natural Edge Wood Course and ended up making two pieces of furniture that I can be proud of. See you again soon for another one of the courses." "I never worked with wood and tools before and I felt very comfortable using them after Colin's great explanation. I am very excited about making my own furniture and I am glad I learned new skills. Perfect for a first time." "Fantastic course! I couldn't recommend it enough for those with and without experience in woodwork. Colin is a true craftsman and a natural teacher of his craft. All round super course!!" "Spent a great two days with Colin learning about all aspects of live edge wood carpentry. Really useful insights, tips and tricks. Can't wait to put it into use on my own projects - I just need to source some wood! Really pleased with my take-home items too." "A thoroughly enjoyable and informative course. Féile and Colin welcomed us into their home and made us feel like part of the family. 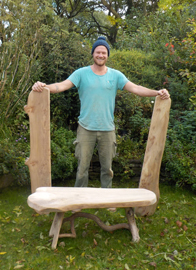 Colin has a wealth of information and is very happy to share all of his woodworking secrets. Very good value for money considering the beautiful pieces we sculpted and were able to take home." "What a course! Great subject, lovely location, lovely projects, great participants, lovely weather. What more could you possibly want? Only one question - when is the next one?" "My 16 year old son and I had a voucher for Mud and Wood. We did not have a lot of experience with woodwork. Before the course we had made wooden tool boxes, but were inexperienced with power tools. We found the course great. We learned loads and were suprised at the tables and shelves that we made. A wonderful course - would strongly recommend it." 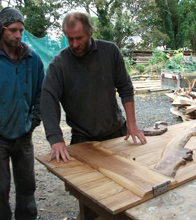 "I really enjoyed the two day course on natural edge wood. Starting with a walk in the woodland to the execution of a piece of natural edge wood furniture for our cottage, it was very satisfying. Colin is a wonderful teacher and spending time with him, Féile and family in their very special cob house and beautiful garden was inspiring. I recommend this course to young and not so young (like me) as a relaxing and rewarding learning experience." "Excellent course. Both practical and theory were well covered. Suitable for both beginners and those with some experience. I would not hesitate to recommend and encourage anyone to try." "So refreshing to re-establish that working with natural materials is so satisfying and to re-affirm that it doesn't have to be perfect to work .... and the fewer the straight edges the better ... beautiful and natural .... as nature is beautiful!" "I enjoy working with wood, but had very little knowledge about sourcing, seasoning and using cut or fallen trees in their natural form. Not only has this course given that knowledge (with a lot of practical tips based on hard-earned experience), it has also encouraged a completely new vision for designing and making objects, mainly furniture, incorporating flowing natural lines from wood in its unprocessed forms with much less focus on detailed traditional cabinet-making techniques than I have been used to." "I had a really good time in a relaxed atmosphere, but very good information and easy direction in practical and theory. I'm hoping to be back soon to do the 9-Day Intensive Cob Building Course. Thanks Colin and Féile the kids and for having me and my dog in your home." "Excellent course packed full of useful tips for all skill levels. Colin's laid back but insightful approach puts you at your ease. Thoroughly enjoyable." "Very valuable tips and tricks that you would only learn the hard way. Provided a great basis to start projects." "Very enjoyable and informative course. Great to get benefit of hands on experience. Nicely adapted to meet requirements of participants." "I came to this course to get an initial handle on the concept of natural edge wood and how to work with it. I certainly got what I was looking for and obtained a great appreciation of the beauty and uniqueness of natural edge timber. Colin's enthusiasm and practical knowledge was inspiring and there was a great atmosphere throughout the course." "Very laid back, informal atmosphere. Loads of useful information, tips and tricks of the trade. The nicest people you'll ever meet. Hosptiality is excellent." "What a great introduction to using natural edge timber in your home. Colin is a patient teacher with a huge amount of knowledge. Féile provides really good food and a a warm environment to enjoy your meals in." "Excellent value, great learning and highly enjoyable." " A great time in Colin and Féile's home, very informative and fun. Thanks. We'll hopefully see you again!" "Great course covering a lot of material and handy tricks and details. Recommend it to anyone with a bit of experience in woodwork." "It was a real treat to learn the small secrets and tips which unlock the magic of natural wood in the setting of this beautifully finished house. 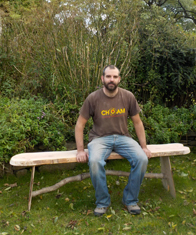 Colin is a warm and generous teacher and inspirational woodworker." "Again a fantastic course by Mud and Wood. These courses give just the right mix of theory and practical. Well done."